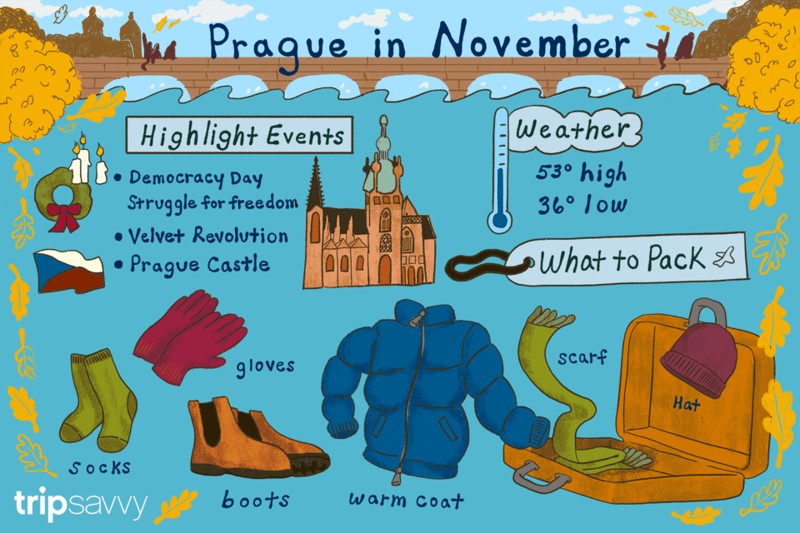 Be prepared for the cold if you plan your visit to Prague for November. But if you don't mind bundling up, you'll find the entire city to be quiet and not very crowded. Unlike summer, fall is an ideal time to see many of Prague's most famous landmarks, like Prague Castle, the Charles Bridge, and the ancient astronomical clock. Additionally, hotel prices plummet during the winter compared to peak season in the summer. If you arrive in Prague toward the end of November, you may be able to catch some early Christmas preparations in Old Town Square. No matter what time in November you visit, though, the City of a Hundred Spires is full of treats. Prague in November is not for those who can't tolerate the chill of autumn. Although the capital of the Czech Republic is a beautiful city full of history and culture, its weather in the late autumn months is brisk and chilly, making it hard to spend extended periods of time outdoors. There's typically 1.30 inches of precipitation during the month. Snow isn't common in November, but it's also not unheard of. Most tourists understandably make the trip to Prague in the spring or summer, when the festival seasons are in full swing, and the weather is warmer, or in December when the city lights up for the Christmas holiday season. To make the most of your November visit, pack cold-weather gear like a heavy coat, gloves, a hat and scarf, and warm boots and socks. You'll also want to bring comfortable walking shoes (ideally waterproof) as most of the city is best explored on foot. If rain or snow is in the forecast, pack an umbrella and a windbreaker or heavy jacket. November is a busy time in Prague with public holidays and seasonal activities that enliven the city. Struggle for Freedom and Democracy Day is celebrated annually on November 17. It is the most important of all Czech holidays and marks the end of what was then the country of Czechoslovakia after the Cold War. Celebrations include a candle-lighting ceremony in Wenceslas Square, where wreaths and flowers are laid at the victory plaque, and a parade. It's a good day to visit history museums, such as the City of Prague Museum, and notably the Museum of Communism, which exhibits original films, photographs, artwork, and historical documents that vividly explain this chapter in the Czech Republic's history. The ​Nouvelle Prague festival was founded in 2012 as the first-ever showcase music festival held in the Czech Republic. Now, the annual festival hosts bands from around the world. The event is held at the Staropramen Brewery in the city's center. The popular Mezipatra film festival takes place each year in mid-November. The event, which is also held in Brno, screens upwards of 70 films with gay, lesbian, bisexual, and transgender themes, and includes corresponding discussion panels. Christmas markets are a big seasonal event in Prague and start at the end of the month. Have a cup of mulled wine and explore the festive stands selling gifts and goodies. Although the big markets in Old Town Square, Wenceslas Square, and Republic Square don't open until December, the smaller ones in Peace Square and Tyl’s Square are available in November. You can save a lot of money by traveling to Prague in November when it's off-season, so keep an eye out for affordable deals on flight and hotel rates. Many of Prague’s must-see sights, such as the medieval Prague Castle and the 13th-century Old Town Square, offer little escape from the cold, making it a necessity to duck into a shop or a café for a break. If the weather is nice during your visit, consider a day trip outside of the city. Fall is an excellent time for hiking in the Czech Republic, and a visit to smaller, nearby villages can be especially charming, as many are celebrating harvest festivals, a unique glimpse into life as a local.